CompuMed is a popular e-pill Automatic Pill Dispenser (Automatic Medicine Dispenser) and Reminder System for tablets and capsules (pill organizer box / automatic medicine dispenser). MD3 Automatic Pill Dispenser: e-pill CompuMed Medication Dispenser System automatically dispenses the proper medication at the right time. All other medicine is locked in a tamperproof pill box (seven (7) day medication cassette). At "pre-set" times medication is automatically dispensed into an easily accessed drawer. The alarm is automatically turned off by pulling out the "pill drawer". 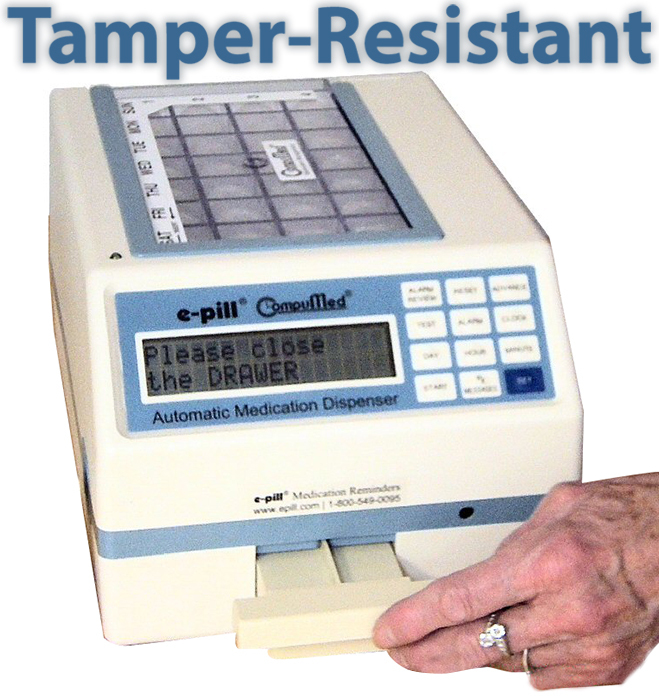 Use the e-pill CompuMed Automatic Pill Dispenser at home or in an assisted living facility. 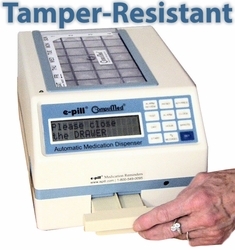 This is e-pill's tamper proof automatic medication dispenser. Developed and manufactured in the USA and marketed by e-pill direct to patients, caregivers & medical health professionals. Locked Automatic Pill Dispenser (includes 2 keys). Tamper Proof (for patients how are trying to get to the medications before it is time). Capacity: ONE WEEK's supply of pills up to FOUR times per day. Secure and Refillable plastic tray (medication cassette) for easy loading. Alarm and Text Message reminders. Long Alarm Duration. Buzzer Sounds Continuously until the pills are removed. CompuMed needs an A/C outlet. No phone jack needed (no need to pay for extra phone lines). CompuMed organizes a week's supply of prescription pills in a refillable secure tray (two trays are included, an A and a B tray which allows remote filling). The medicine tray is locked securly into the device which is quickly and easily programmed to deliver medications into the removable dispensing "pill drawer". Time to take the medications .... the buzzer sounds continuously until the pills are removed and the drawer is replaced in the e-pill CompuMed. CompuMed dispenses dry oral medications (pills, tablets, caplets etc) and displays important instructions (text message) for all your medications. It has a two week Battery Back-up System, is Lockable (2 keys are included), Tamper-Proof. Each medication tray compartment has a capacity equal to 25 aspirin sized tablets. Two (2) Medication Cassettes (trays) are included. Easy Set-up. The e-pill CompuMed unit comes complete with everything you need to get going. CompuMed size: 7" wide, 6" high and 11" deep (about the size of a large shoebox). Weight: 7 lbs. | Tamper Proof with Robust Lock - Two (2) keys are included. One Year Warranty by manufacturer: CompuMed, Inc. | 30-Day Money Back Guarantee. FREE Standard Shipping & Handling (US customers only). Risk free purchase with our 30 Day Money Back Guarantee. Order your complete CompuMed Automatic Pill Dispenser Sysemt from e-pill Medication Reminders today!